Wastewater treatment accounts for approximately 3% of the total electricity used in the United States of America. This amounts to a ~$120 billion dollar per year expense when adjusted for inflation. However, the wastewater we treat contains ~3.5x more chemical energy than the electrical energy required to treat it. This means that, in the USA, we flush over $360 billion down the toilet every year. This is enough energy to power 9-12% of the total USA electricity demand. Tapping into technologies that are capable of transforming the chemical energy in wastewater into electrical energy is essential for meeting our wastewater treatment and energy needs. 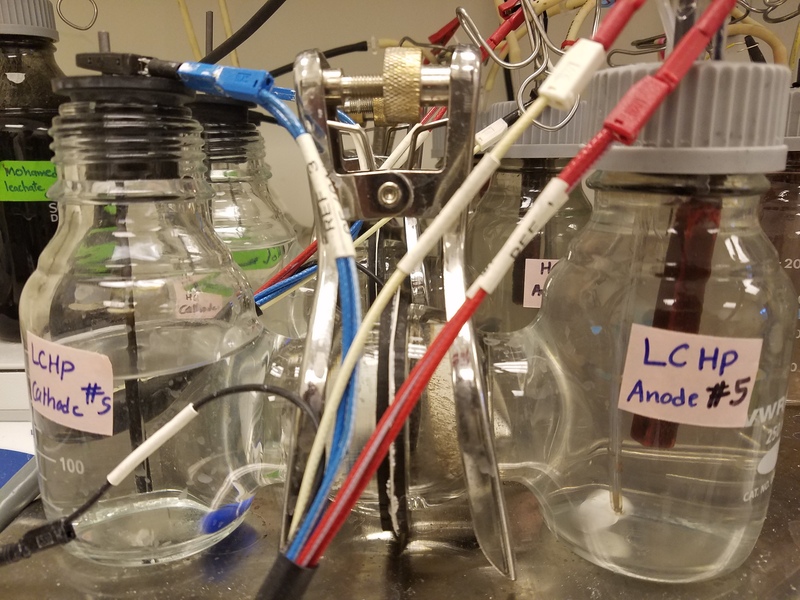 Microbial Electrochemical Cell (MXC) technology harnesses the power stored in wastewater by using bacteria as a catalyst to convert the chemical energy in wastewater into electrical energy. See the subsections below to learn more about how this process works. Anode respiring bacteria (red biofilm) shown growing on the anode of an H-type microbial electrochemical cell. Bacteria that survive by using metal as a terminal electron acceptor are called dissimilatory metal reducers. This means that these bacteria use metal in a similar way that humans and other animals use oxygen. A few examples of metals in the natural environment that may be used include iron oxides, sulfur oxides, or humic substances. 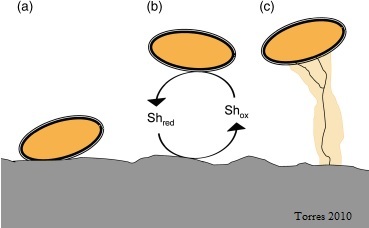 In microbial electrochemical cells, we replace these metals with an anode and the bacteria form a biofilm on the anode (the red film shown in the picture above). 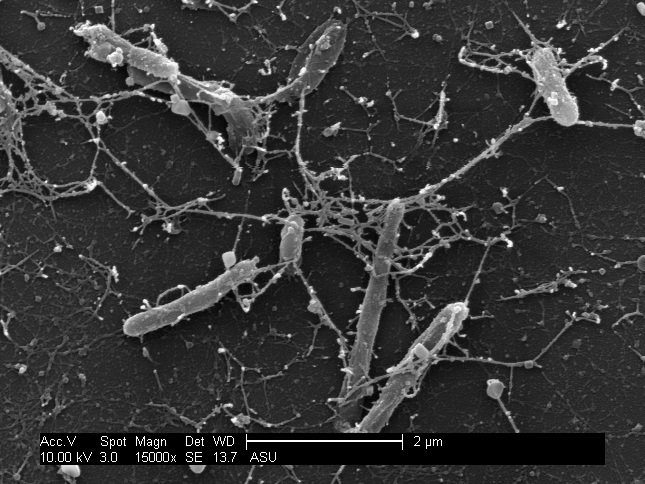 Image of a biofilm that has formed a conductive extracellular matrix taken at 5000x magnification using a scanning electron microscope. Once the bacteria form a biofilm, they act as a catalyst to convert the chemical energy stored in wastewater into electrical energy. This conversion in bacteria happens in a way that is very similar to our own metabolism. The bacteria first ingest the remains of our food that are in wastewater (poop!) and then digest the compounds to produce electrons within their cells. These electrons are then funneled through the electron transport chain to produce energy in the form of ATP. Once the electrons have been used to generate energy for the cell, they need to leave the cell via a terminal electron acceptor. 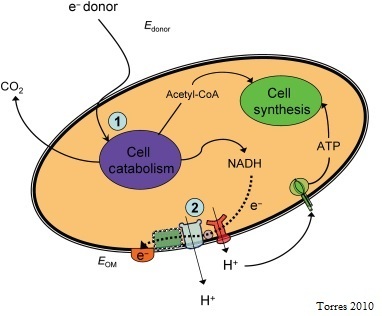 The main difference between humans and ARB is that these bacteria do not transport electrons to oxygen; instead, they transport them extracellularly to an anode via a conductive extracellular matrix. Potential appendages responsible for extracellular electron transfer taken at 15,000x magnification with a scanning electron microscope. The way in which electrons are transferred from the biofilm to the electrode varies by bacterial species. 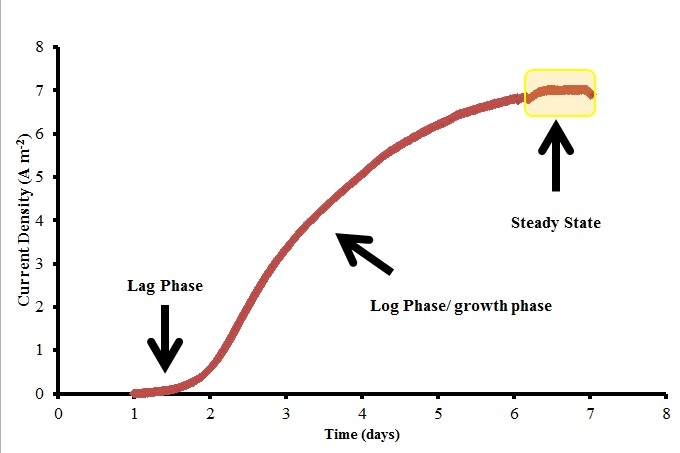 Currently, there are three pathways through which bacteria can send their electrons to an insoluble external electron acceptor: cellular shuttles in which electrons are sent in vesicles from the cell to the electrode, direct contact of the whole cell to the electrode, or long range direct contact of part of the cell (pili, nanowire, or extension of an outer membrane) to the electrode. This is highly debated topic in the field and makes for a lot of fascinating research! 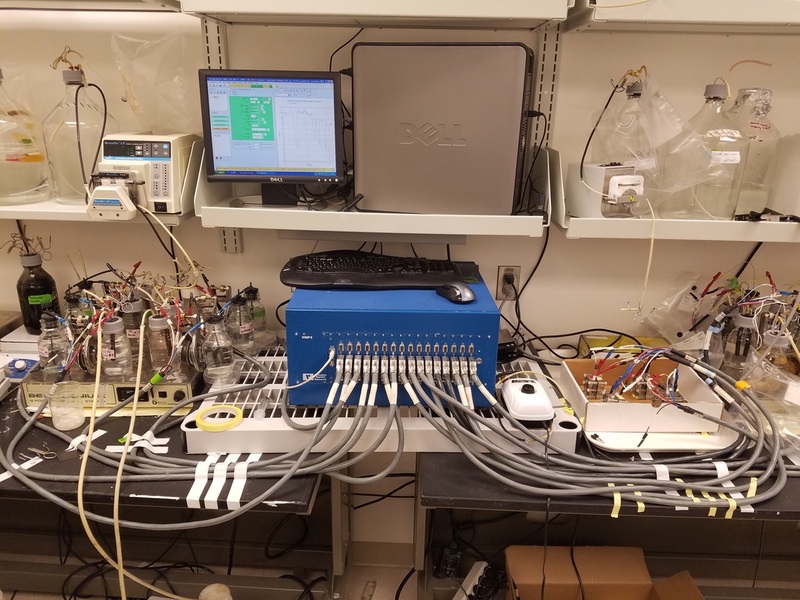 Electro-active biofilms can be monitored using multi-meters or a potentiostat (the big blue box). A potentiostat can be employed to monitor the conversion of wastewater into current. Since the metabolism of the biofilm is directly coupled to electron transfer to an electrode, a signal is produced that is equivalent to the the metabolic rate of the biofilm. This means that growth kinetics and current generation can be monitored in real time! If you are interested in donating to research for the development biotechnology, click the link below!